On May 14, the departure ceremony for the XCMG bridge inspection vehicles exported to South Korea in bulk was grandly held at XCMG Truck-mounted. Sun Xiaojun, General Manager and Secretary of the Party Committee of XCMG Truck-mounted, Jiang Nan, Secretary of the Party Committee of XCMG Import & Export Co., Ltd., Jin Daxian, Director of Korean Bridge Inspection Company, Zhao Wei, Deputy Secretary of Party Committee of XCMG Truck-mounted, Yin Yonggen, Manager of Korean Bridge Inspection Company, relevant people in charge of overseas marketing of XCMG Import & Export Co., Ltd. and hundreds of employees of XCMG Truck-mounted together witnessed the important historical moment when XCMG bridge inspection vehicle was first exported overseas. At the departure ceremony, the vehicle fleet is neat and uniform. The white bridge inspection vehicles custom-made for South Korean customers are ready to start and form a splendid landscape. The first batch of vehicle will be exported in the ceremony, and later the other two batches of bridge inspection vehicles will be sent to South Korea in succession. 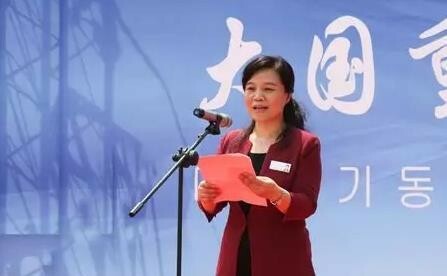 Sun Xiaojun, General Manager of XCMG Truck-mounted delivered a speech that the current peace process in the peninsula is rapidly improving. China, Japan and South Korea have accelerated the negotiations in the free trade zone. The regional situation is conducive to the development of trade between China and South Korea. XCMG and the Korean Bridge Inspection Company are the participants and builders of the process, and XCMG product will also be a witness of friendship and peace in the region. With more than 20 years of technological accumulation, the XCMG bridge inspection vehicle not only realizes synchronization of technical parameters with internationalization, but also surpasses international similar products in terms of super-span technology and in-situ vehicle show technology. The cooperation between XCMG and the Korean Bridge Inspection Company is the starting point for the internationalization of the XCMG bridge inspection vehicle and plays an important role in accelerating the internationalization of the Company. 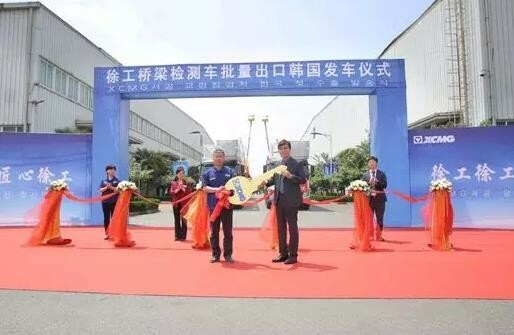 Jiang Nan, Secretary of the Party Committee of XCMG Import and Export Co., Ltd., said that the South Korean market is a high-end market that XCMG has always attached great importance to, and XCMG is also the first Chinese construction machinery company to enter South Korea. In 2017, XCMG’s exports to Korea increased by nearly 100% year-on-year in 2016. Speech by Jiang Nan, Secretary of the Party Committee of XCMG Import and Export Co., Ltd.
Jin Daxian, Director of the Korean Bridge Inspection Company, made a speech after receiving the golden key. He said that XCMG is a first-class manufacturer of bridge inspection vehicle in China and even in the world. He was grateful to the R&D personnel of XCMG Truck-mounted for personally rushing to the construction site in South Korea to collect customer needs and customize the perfect design. In the future, the company will give full play to the location advantage of the XCMG exclusive agent in South Korea, actively cooperate with XCMG to open up overseas markets, and look forward to more extensive and in-depth cooperation between the two parties. In 1991, China’s first bridge inspection vehicle was successfully developed by XCMG and achieved a zero breakthrough in China, with the boom type. 13 years later in 2004, China’s first trussed bridge inspection vehicle was off the assembly line in XCMG. Once invented, XCMG trussed bridge inspection vehicle was rapidly favored by the domestic market for its high efficiency and stable performance and cost performance far better than that of imported products. After more than 20 years of technological accumulation and market development, XCMG, as the first unit and leader in the industry of bridge inspection vehicle in China, has owned the only domestic production line of bridge inspection vehicle with a capacity of 100 sets per year and presided over the development of the first product industry standard of China--QC/T826-2010 Bridge Inspection Vehicle. With nearly 30 years of experience in the construction, sale, and leasing of bridge inspection vehicles, the Korean Bridge Inspection Company is a leader in the industry of bridge inspection vehicle in South Korea. The South Korean market is a medium and high-end market that XCMG has always attached great importance to. The South Korean regulations impose stringent requirements on the outer dimensions and axle load of the products. Therefore, higher technical requirements are placed on XCMG bridge inspection vehicles. The technicians personally rushed to South Korea to conduct first-line investigation of the project to obtain first-hand information on the layout of the vehicle, distribution of axle load, lightweight design of the structure, design of details and user-friendly functions and repeatedly communicated with Korean customers to constantly adjust and improve technical solutions, so as to properly solve the problem that the height, width, and total weight of China’s bridge inspection vehicles have been slightly higher than the regulatory limit, which has won high praise from Korean customers.